The Holy Disciples Aristarchus, Pudas and Trophymos were from among the Seventy Disciples, whom the Lord Jesus Christ had sent before him with the good-news of the Gospel (Lk. 10: 1-24). The holy Disciple Aristarchus, a co-worker of the holy Apostle Paul, became bishop of the Syrian city of Apameia. His name is repeatedly mentioned in the book of the Acts of the Holy Apostles (Acts 19: 29, 20: 4, 27: 2) and in the Epistles of the Apostle Paul (Col. 4: 10, Philemon 1: 24). 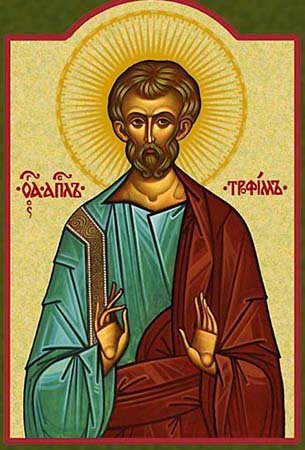 The holy Disciple Pudas is mentioned in the 2nd Epistle of the Apostle Paul to Timothy (2 Tim. 4: 21). He occupied high position as a member of the Roman Senate. At his home the saint took in the First-Ranked Apostles Peter and Paul, and believing Christians gathered. His house was converted into a church, receiving the name "Pastorum". In it, according to tradition, the holy Apostle Peter himself served as priest. The holy Disciple Trophymos hailed from the city of Edessa. His name is mentioned in the book of the Acts of the Holy Apostles (Acts 20: 4) and in the 2nd Epistle of the Apostle Paul to Timothy (2 Tim. 4: 20). He was a student and companion of the holy Apostle Paul, sharing with him all the sorrows and persecution. All these three holy disciples accepted a martyr's death at Rome under the emperor Nero (54-68), concurrent with that of the Apostle Paul ( c. 67).